The Sauber F1 Team has officially taken delivery of a 3D printer built by Additive Industries. 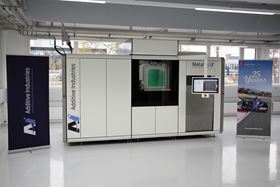 According to the company, Sauber Motorsport AG has over 10 years of experience in additive manufacturing in plastics and the Team is now expanding its 3D printing competences and capabilities to metals. The investment in two MetalFAB1 systems will reportedly help reduce manufacturing cycle time of wind tunnel models and F1 race cars as well as third-party business.